The latest iteration on the Chevrolet Impala theme. What were GM designers thinking when they crafted the 2014 Chevrolet Impala? Well, they must have looked at various models that have worn the Impala name down through the years and decided that there was only one way for the new design to go. And that was up. And “up” they went with the tenth generation Impala, a model that loses its “fleet appeal” status to gain a design that is at once sporty, elegant and even luxurious. This writer spent a week with the Chevrolet Impala LTZ, a premium model that represents the pinnacle of Chevy’s flagship sedan. It is no secret that the Impala name had lost its appeal. Introduced in the late 1950s as the top-of-the-line edition for the Chevrolet Bel Air line, Impala soon became a stand alone model. Down through the years Impala and Caprice have traded flagship status, but when the two sedans were offered concurrently it was the model named for the African antelope that ultimately ruled. Unfortunately, Impala has suffered a number of slights across its ten-generation lifespan. Twice, the model was canceled and brought back, the first time as the 1994 Impala SS and the second time as the replacement for the dreadful Lumina. Indeed, when the Impala name reappeared for the 2000 model year, GM essentially updated the Lumina platform and renamed the sedan. In 2006 the ninth generation model was introduced and stayed in production until the 2014 model rolled out this spring. EPA: 19 mpg city, 29 mpg hwy. Perhaps GM could have played it safe with the Impala by simply updating its veneer. From a marketing perspective that approach probably would have worked as 70 percent of its sales in recent years have been to fleet buyers — car rental companies, taxis and such. Its fleet efforts kept the Chevrolet Impala as the top-selling sedan even as newer models from Ford, Dodge, Toyota and Hyundai were rolled out. More importantly, the aged Impala has reflected poorly on the rest of Chevrolet’s now modern line up, looking positively ancient when placed in a line that includes the midsize Malibu sedan, the compact Cruze, the subcompact Sonic and the Chevy Camaro. The Chevrolet Impala LTZ may not be the edition that most Impala shoppers will buy, but it is one that should be compared with the other Impala sedans. Five trim levels are available: LS, 1LT, 2LT, 1LTZ and 2LTZ. My test model was the 2LTZ. Both the Impala LS and 1LT are powered by a 195-hp four cylinder engine. Yes, that’s right: GM stuck a “four” under the hood of the car, a normally aspirated engine that pales in comparison to the 3.6-liter V-6 that powers the three other editions. GM did that to squeeze more miles per gallon out of the sedan, but that 2 mpg advantage with the smaller engine also means you lose 110 horsepower. Let’s cut to the chase here: the all-new Chevrolet Impala deserves the larger engine as it provides the performance you expect in a car of this size. Anyway, with an EPA rating of 19 mpg in the city and 29 mpg on the highway, the V-6 Impala shines. If you like a sporty and elegant persona, the Chevrolet Impala delivers. This sedan has a face that takes Camaro styling cues and blends it with a body that isn’t unlike the Buick LaCrosse. Indeed, the Impala shares its front-wheel drive platform with the LaCrosse as well as with the new Cadillac XTS. There are some differences between all three models with only Cadillac offering optional all-wheel drive. Chevrolet’s ad agency calls the Impala a “stunning reinterpretation of the premium sedan.” You will get no argument from me here. The Impala LTZ especially shakes things up by presenting a model that stands out among the segment’s newest sedans: the Toyota Avalon and Hyundai’s Azera. And it makes the Chrysler 300C and Ford Taurus appear old. An argument could be made that the LTZ is on par with the Lexus ES 350, such is its premium features. The Impala LTZ upgrades the standard sedan by enhancing its sweeping stance with a number of embellishments including HID headlamps, boomerang LED daytime running lamps, 19-inch aluminum wheels, a power sunroof with a second row skylight and dual chrome-tipped exhaust ports. Inside, leather is nearly everywhere — on the seating surfaces, across the dashboard and on the steering wheel. 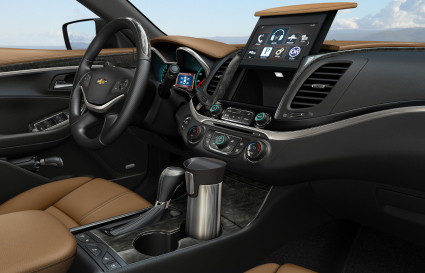 Chevrolet chose to offer a contrasting interior with Mojave leather and jet black panels, offering a rich, even clashing look that this writer did not find appealing. However, he was only one vote in a family of four that was evenly divided between disliking and liking its look. For the record, my wife “loved” it. An eight-inch color display dominates the center stack and features the Chevrolet MyLink infotainment system. MyLink is simple to use as various touches, swipes and voice commands make it easy to retrieve information including mapping your route, finding the nearest pizza restaurant and helping you to choose your music. Just know that not all commands are always understood with my oldest son and I having a hard time convincing MyLink that we didn’t want to go to Korea, rather we wanted to map our way to Kure (pronounced Cur-ee) Beach. That annoyance could have been overcome by calling OnStar and asking a live assistant to send those coordinates to us. We were too stubborn to ask for help, but were glad to know that it was available. Do you remember when large sedans offered a slab bench seat in the front? Happily, those days are long gone and the Chevrolet Impala features what nearly everyone wants: two sport bucket seats that adjust, offering ample support as well as a heating and cooling feature. The driver’s seat along with the adjustable steering column give you a seemingly infinite number of positions to try in a bid to enhance comfort and to take in the digital and analog sport gauges. When behind the wheel of the Chevrolet Impala, you won’t think for a moment that you are driving one of Europe’s finest sedans. That statement is not meant to take a swipe at the Impala, rather to define what this model is: a comfortable, quiet, premium sedan that offers a solid ride, a good drive and a responsive engine. Steering and handling responds sufficiently and if you want a taste of spirited driving the automatic transmission can be shifted into manual model. But, there are no paddle shifters present. Instead, you shift up and down with the button located on the top of the gear shifter. Likely, most Impala shoppers will not buy this car for its shifting capabilities. The automatic does this for you and smoothly too. 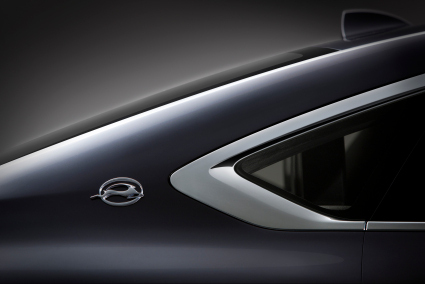 Lots of special touches make the new Impala an attractive consideration. Most notably, the secured storage panel located behind the center stack display screen is innovative and smart. Push a button and the panel raises to reveal a compartment large enough to put in your wallet and smartphone. A 12-volt USB outlet within this space can recharge your phone. The compartment can be secured too — simply enter your passcode and the keyboard locks — what Chevrolet calls its valet mode. Another 12-volt outlet is found in the storage compartment separating the front seats, itself offering enough room to house a small purse. In-door storage, beverage holders and rear seat heating controls are also included. The LTZ’s 120-volt outlet is found in the rear seat panel. A pass-through to the trunk makes it possible to expand the Impala’s 18.8 cubic feet storage compartment. And interior LED lighting and ambient lighting are premium touches that help round out this sedan’s charm. Safety features including 10 standard airbags, collision avoidance, a rear backup camera and adaptive cruise control are part of the LTZ experience. 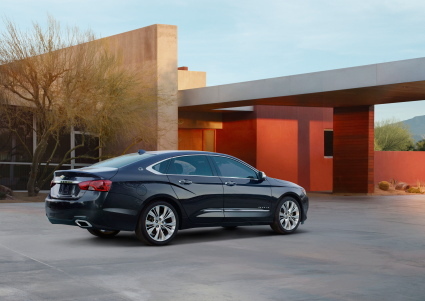 All-new 2014 Chevrolet Impala hits the mark. There may be price shock for some shoppers as they investigate this full-size sedan. The price point for large sedans generally begins in the low 30s and rises from there. The base Chevrolet Impala retails for $26,725 or about $5,500 less than the Hyundai Azera. The Ford Taurus SE retails for $26,700, but it is powered by a standard 3.5-liter V-6 engine. If you want a V-6 Impala, it is standard on the $29,950 2LT. As priced, my fully loaded test LTZ retailed for $39,510. A similarly equipped Toyota Avalon Limited is priced from $39,650, while pricing for select Chrysler 300C models easily tops $40,000. So, even though pricing may shock some shoppers, the reality these days for premium sedan buyers is a price point approaching $40,000. That’s where you will find the 2014 Chevrolet Impala LTZ, a five-passenger sedan entirely worthy of its flagship status. And it is a decidedly unboring one too. Photos courtesy of General Motors Company.